Writing this poem helped me launch the writing of my memoir in which I explore the origin of the depression I experienced in my early twenties. One of the truths I discovered in this process was the existence of a powerfully destructive eidetic image I had carried with me that had undermined my self-esteem. 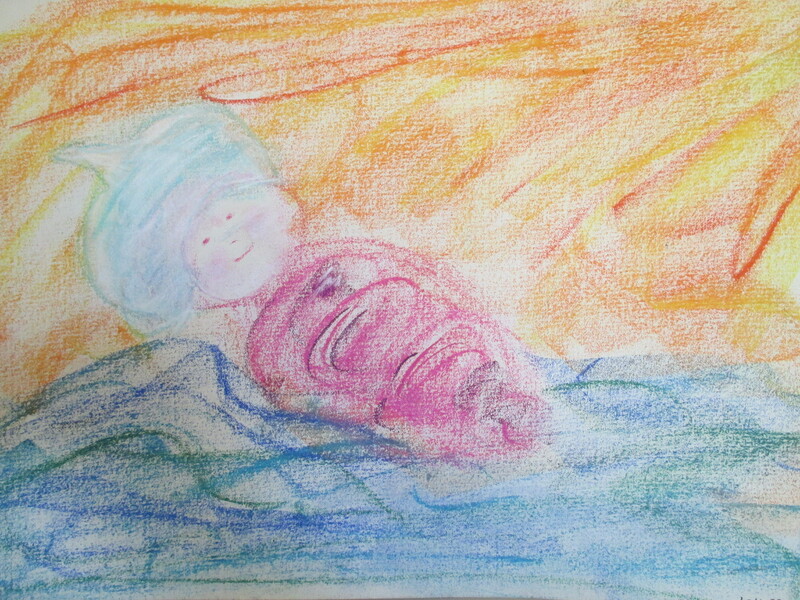 In a session with my therapist, Lee O. Johnson, she asked me to draw the image I had of myself as a baby. 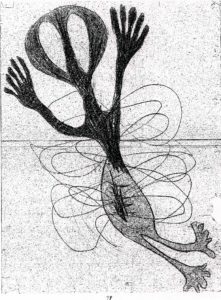 This image appeared on my drawing paper: a record of my having undergone stomach surgery for pyloric stenosis at 26 days old. Perhaps this picture is best described as a representation of my mother’s memory and of my felt experience. The strings surrounding my abdomen originated from my traumatized mother’s observation of me after the surgery: “You had tubes coming in and out of every opening in your body, even from your head!” –words that, as a little girl, disturbed me deeply. The angry gash at my center reveals the pain I felt, for the incision was made and the operation performed without anesthesia. My shocked, vacant eyes, hands thrown up in surrender and webbed feet dangling, speak to the horror and helplessness I felt. How could I grow to feel powerful and confident with a conception of self built upon this image? My trauma was unresolved and deep and connected to my mother’s pain. 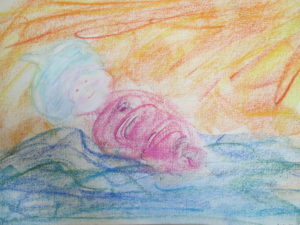 I am happily held by the waves, wearing a Sufi turban, awaiting loving arms to scoop me out of the water. In my wrappings, I feel safe and hugged, valued and sustained by a loving environment of sun and water. Robed in healing purple, I float to shore. This image makes me happy. Oh, I love those images. So true that transforming images is so healing. I am intending that you find your publisher this year. Thank you for believing in my work and for appreciating the images. You got it–“transforming images is so healing.” Thinking of you with love. There is so much artistry and insight in this post, Wendy. I feel enriched and inspired by it. What a wonderful gift to begin the new year. Thank you. Thank you for marking the change of year by reflecting on these two images, one ugly and angry, yet poignant, the other full of light, good cheer and hope. I also hope that your “Sea Creature” project will be published this year, and wish you well, Wendy, as you work through the list of what is necessary for this to happen.